Last day for BMX Practice prior to the STATE FINALS!!!!!!!!! Come out to the SANDBOX for some BMX fun 3pm-dark. ATTENTION! Start Time Change for State Championships! We are changing the start time for next Saturday's State Championship Finals race. Previously it was scheduled to start registration from 2 to 3 pm, and we now are moving it later to 4 to 5 pm. Aloha! Registration 4-5pm. Fee $12. See you at the Sandbox! Come out for BMX and STRIDER practice today. 3pm until dark. 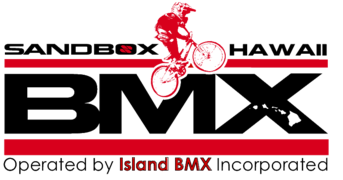 BMX and STRIDER Balance bike races Saturday 9/17. Registration $12 4-5pm. Races asap. See you at the Sandbox! NO BMX TODAY. It is just too wet. See you Saturday for BMX and STRIDER races. Be safe out there. Single point races Saturday 9/10. Registration 4-5pm. Races asap. See you at the Sandbox!